Honestly, I don’t even know how to start this. A week later and I’m still trying to get over what I have come to call “Post-California Depression Syndrome“. 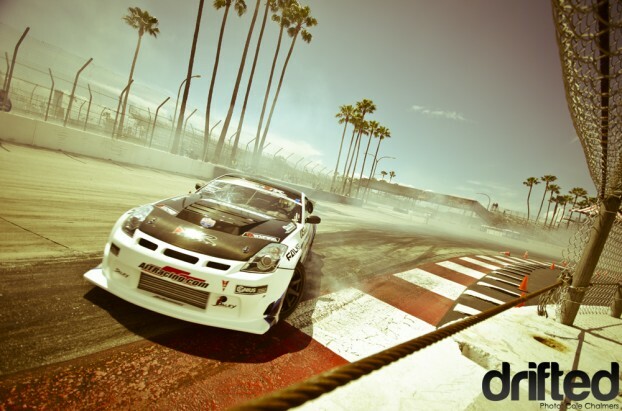 This is the first time I attended a Formula D event and the first time I’ve been to California besides a trip to Disneyland when I was younger that I can barely remember. Needless to say, my brain was not prepared for the mind blowing it was to receive. I ended up staying two days longer than I originally intended and I’m feeling it in the wallet something fierce now, but it was so worth it. If you weren’t watching in person, or live online, you missed some serious action. So I’ll do my best to fill you in on the event through my eyes. Patrick Mordaunt gets nice and close for my lens in his 350z. Mind blower number one: The weather. It was overcast for maybe half a day, and it rained for all of 15 minutes. The rest of my trip was sunny and warm but locals kept apologizing for the weather, I just laughed because it was raining and cold back home. Mind blower number two: the amount of media at the event. I had no idea what I was in for, I lucked out with this spot for a little while and had it all to myself for most of practice and qualifying, but my secret got out by top 32 and I was hard pressed to squeeze in there for a few shots during the second day. Fun fact: Walker’s sticker’s were done at 3am, by Ian Dillon of Factory 83, the night before we were leaving for Long Beach. It made driving very difficult the next day. Mind blower number three: Have you heard of Fatlace driver Walker Wilkerson? If not, learn it. Remember it. Find a picture of him and remember his face. Because you’ll be wanting to ask him for his autograph by the time Formula D is over this season. I predict rookie of the year going to Walker. 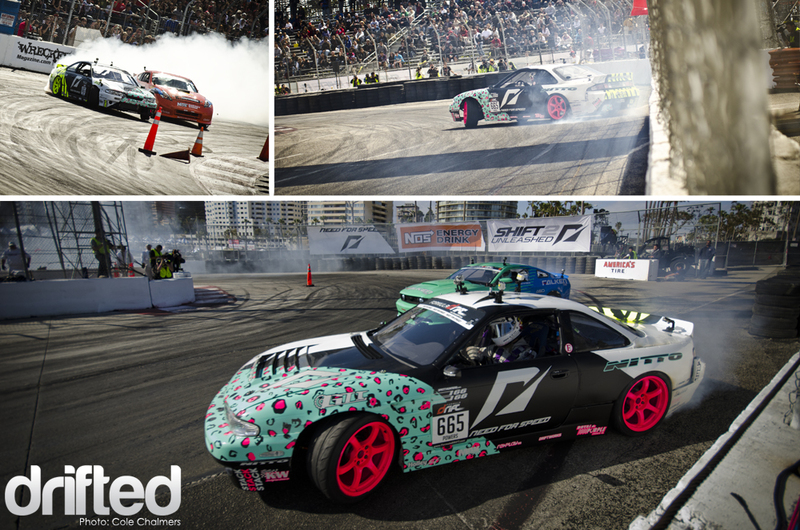 This was his first FD event and he qualified 7th, and finished at a solid 11th place, not bad for a rookie. On top of that, Wilkerson’s car is one of the few in the sea of V8’s this year to be running an SR20. Fun fact: I saw Jr at The Pike after Long beach. He likes to party. 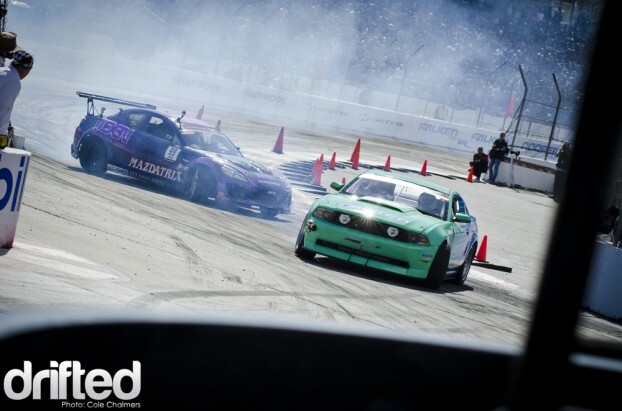 The big upset of Long Beach was last year’s champion, Team Falken driver, Vaughn Gittin Jr. not even qualifying for top 32 in his 2011 Ford Mustang. You can guarantee he will be ready to slay come Road Atlanta. Ross Petty was shredding hard in the Garage Boso/Falken Tire S15. 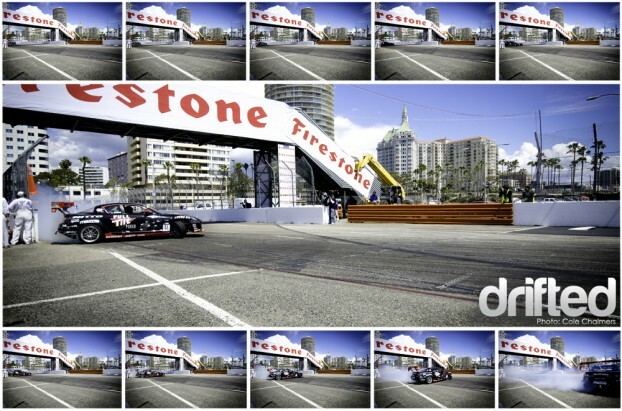 I always liked Ross and his car, but after Long Beach I think he is my new favourite driver. He is such a gangster and drives hella aggressive! Those Garage Boso guys are wild, I would love to hang out with them for a week to see the shenanigans they get up too. Mind Blower number 20: Santa Claus. Ladies want him. Guys want to be him. This guy is a legend. The guy stands like a statue at the end of the wall where cars come scraping across at full speed. The man is fearless! I had the chance to talk to him for a little bit, and he is one rad dude. Standing behind the safety of the wall, a few feet from him, and having cars roaring past was an incredible rush. I can’t imagine how heart racing it would be to stand where he does. I think this shot caught the only time he ever flinched, as Joon Maeng‘s spoiler almost took off his hat as it hung over the wall when he scraped past. Fun Fact: After congratulating Matt Powers on his solid finish at Long Beach, I offered him a beer which he politely turned down. Apparently he doesn’t drink or smoke and eats super healthy. 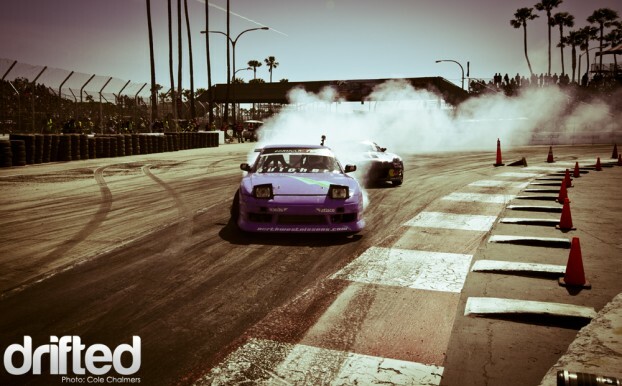 Stunting on fools in both drifting and fitness, mad props! 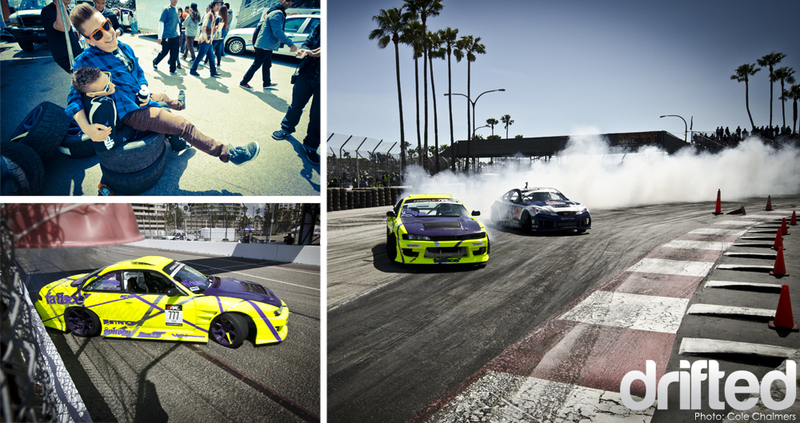 Team Need For Speed driver Matt Powers stepped up his game something fierce this year. His decision to go V8 for 2011 has already paid off as he smoked the competition to place 2nd. 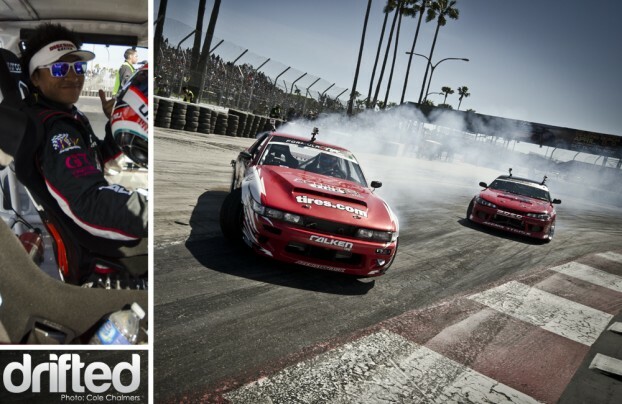 As much as I don’t like the whole V8 movement in drifting, this proves how much a of difference it can make. Matt did well last year, but if this is any indication how the rest of the year is going to go for him, he has full potential to take that top podium spot. Fun Fact: I got my Speedhunters debut taking the bottom-left photo, look for it. I’m famous now. 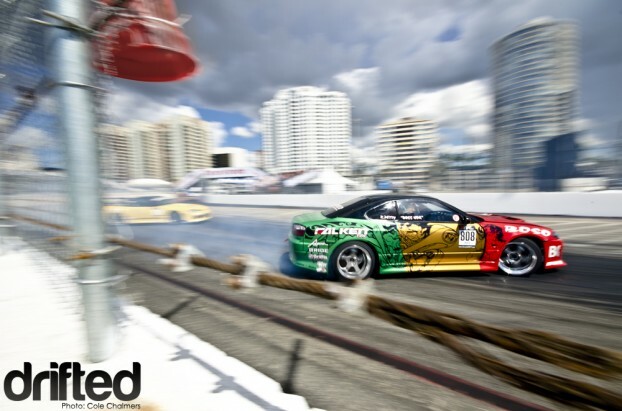 Speaking of going V8, Team Fatlace driver Matt Field switched up his beat up S13 chassis for an S14 and doubled his cylinder count for 2011 as well. Repping NorCal hard, Matt qualified 12th but was knocked out by Rhys Millen‘s Hyundai Genesis in the second round. I hoping for big things for Field this year, I got to hang out with him a lot during Long Beach. He is a champ and definitely deserves some podium finishes under his belt. Daijiro Yoshihara‘s consistently killer runs in his Discount Tire/Falken Tire V8 Silvia took him to third place on the podium. Dai has got to be the most grateful driver on the FD circuit. Every time I saw him he had a huge smile on his face and was thanking someone for something. During the award ceremony all I could hear coming out of his mouth was “Thank you!” “Thank you so much!”. Even after I took that photo of him in his car, “Thank you!“. Justin Pawlak had a rough go earlier this year after having his Rx7 stolen, but I think he feels a lot better now after taking his first win at Formula D in the Falken Tire Ford Mustang. I don’t think I’ve ever seen someone so amp’d before. He honestly looked like he was on the verge of tears he was so happy. Definitely a well deserved victory for Pawlak, it was a close battle between him and Matt Powers but when Matt fell behind in his following run it was obvious the win was going to Justin. Congratulations Bro!